For over 25 years, Hudson Poly Bag has served the medical packaging and medical device marketplace with poly bags and poly tubing. Approximately 50% of our business efforts are focused in these market areas. Because of this focus, all of the materials we extrude or purchase are 100% prime FDA approved materials, 100% of the time – never any recycle content or off spec materials. Hudson Poly Bag’s track record is 99% on-time delivery, 0.5% Quality returns and statistically non-existent billing errors. We strive for perfection via continuous improvement to consistently be On time, On spec and On price. We simply do what we say that we will do. Hudson Poly Bag also stocks specific customer approved resins for critical requirements. Our MRP system provides lot trace-ability and specific manufacturing instructions for each individual poly bag we manufacture, so our customers consistently get the same identical quality poly bag time after time. Customer specifications and drawings are maintained and accompany each work order as product is being manufactured. All materials are rigidly controlled throughout our processes. Our medical customers purchase tubing roll stock for their automated packaging equipment, very narrow tubing for catheter packaging, as well as plain and printed poly bags. All of these products are manufactured to the customers exacting, and often very critical, specifications in a clean, climate-controlled environment. Each manufactured item also has its own specific work order instructions, which incorporates the specific customer’s needs and requirements. We manufacture products that can be sterilized by ETO, gamma and autoclave methods. 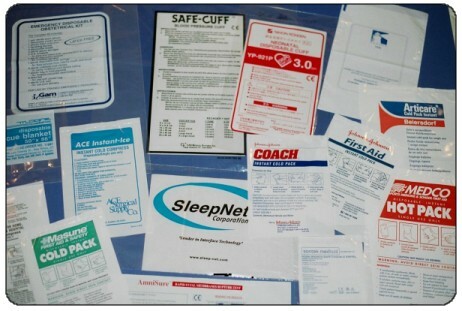 We routinely issue Certificates of Compliance to our Medical customers. Click here to see our new Tamper Evident Medical Specimen Bags. Click here to see a list of past and current medical customers.